Used with my PC. Bulb says 3402 hours. 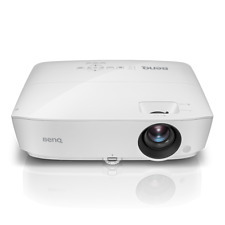 BenQ MS524AE Projector. High fill factor increases clarity for black and white or color images and reduces eye strain for presenters and audiences to stay focused on the content. Resolution: SVGA, 800 x 600. Power Cord, VGA cord, HDMI cord. Everything included in the ad is shown in the pictures and listed in the accessories line unless otherwise stated. Everything included in this ad is shown in the pictures unless otherwise stated. BenQ MX660P DLP Projector Refurbished 977 hr used. Projectors are powerful tools for making successful presentations. To ensure a smooth presentation on your part, BenQ has integrated various display functions into the MX660P to fit every need! 2 hdmi ports. picture is very bright and clear. BenQ MP780 ST Specs. 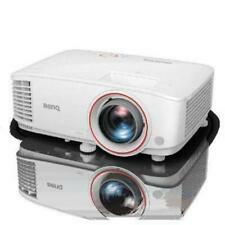 Projector Model MP780 ST. Technology DLP. Projection DLP. DVI or HDMI No. Blu Ray 3d No. Brightness (Manufacturer Claim) 2500. Lens Shift No. Trending at $93.12eBay determines this price through a machine learned model of the product's sale prices within the last 90 days. Certified BenQ Refurbish - Includes 90 Days Warranty!!! BenQ MX810ST DLP Projector Refurbished 1190 hr used. Display Type: DLP. Great short throw projector easy to use, with great zoom feature as well as keystone correction. Projector housing yellowed, but it doesn't affect projector functionality. Item test watch full function work good, has scratches on unit ,has heavy scratches on lens, see picture. missing remote. Trending at $120.00eBay determines this price through a machine learned model of the product's sale prices within the last 90 days. BenQ MH760 Specs. DLP Link 3D Yes. Native Chip Resolution 1920 x 1080 (Full HD). Lens Shift Vertical: 6%. Lens f/2.59 - 2.87 (f = 16.88 - 21.88 mm). (Don't see your country listed?. Color Depth 10-Bit (1.07 Billion Colors). ). Featuring Rec. 709 specifications. 709 Cinematic Colors. While most projector manufacturers choose a saturated color tone bias towards increased colorfulness, resulting in color accuracy loss, the HT3050 fully achieves the Rec.709 color standard. 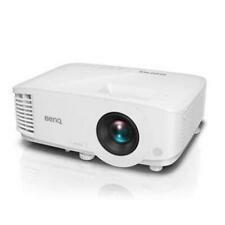 BenQ MS524A Home Theater Projector - White. Condition is Used. Shipped with USPS Priority Mail. BenQ MX525 Specs. Native Chip Resolution 1024 x 768 (XGA). Display System -Chip DLP. DLP Link 3D Yes. Inputs/Outputs 1 x HDMI Audio/Video (Input). Lens f/2.56 - 2.8 (f = 21 - 23 mm). Works worldwide from 100 - 240V, 50/60HZ. Trending at $219.99eBay determines this price through a machine learned model of the product's sale prices within the last 90 days. 2796 hours used. 2 hdmi ports. picture is very bright and clear. Model MX520. Display Technology DLP. Color Support Full Color (1.07 Billion Colors). Light Source Power 210W. HDTV Formats 480p, 1080i, 576p, 1080p, 576i, 480i, 720p. Audio Outputs 3.5mm Mini Jack. Contrast Ratio 13000:1. 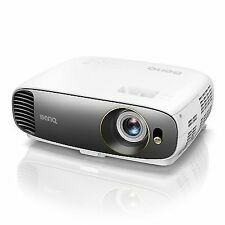 New ListingBenQ HT9050 LED 4K Ultra HD 2,200 Lumen Projector 20,000 hours lamp life! Condition is New. Box may Have slight ware, but this unit is in New Condition - Un-Opened. Pro Cinema Projector with 4K, DCI-P3, HLD LED, Video Enhancer | HT9050. 4K UHD(3840 x2160). VGA (640 x 480) to 4K UHD (3840 x 2160). 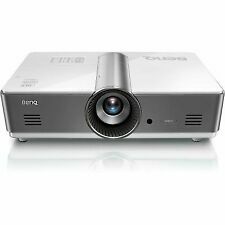 BENQ Projector MH760 5000-Lumen (5K) Full HD DLP NEW. Condition is Manufacturer refurbished, in unopened original packaging. BenQ HT2150ST Home Theater 1080p DLP Projector Short Throw For Gaming Sports. Shipped with USPS Priority Mail. We bought this projector for one of our testing projects. However we did not use this model in the end. So this specific unit is brand new except for the box has been open to for the picture purposes. Good luck bidding. Just a Standard SmartPhone Projector I got as a gift and don't need. 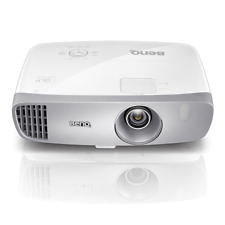 BenQ HT2150ST Full HD DLP Home Theater Projector (HT2150ST). Very low lag. Ideal for gaming and great for sports. Condition is Used. Lamp has only 98 hours of use. Includes remote, storage bag, power cord and manual. Shipped with USPS Priority Mail. This projector has been tested to ensure the best possible quality. The projector is in good overall physical condition. (Does not affect functionality). firmware version 1.02. Projector has a nice image, 1032 hours is not bad, good shape, it is missing the front level to raise the projector, last picture shows it. MPN MX660P, 9H. Model MX660P. Display Technology DLP. Video Input 4 Pin-Mini DIN (S-Video), Composite Video, Hdmi X 1, Component Video, 15 Pin D-Sub VGA (& Component) X 2. Form Factor Portable. Connectors Composite (RCA), USB, Component. BenQ HT2050A 1080p Home Theater Projector Pre-owned. Shipped with USPS Parcel Select Ground. Model: MP612C. Manufacturer: BenQ. This projector is used and is in good working order. The power cable and lamp are included, but the remaining life/hours of use are not known. Local pickup is always an option. This works perfectly as it should and really produces a nice image. The focus uniformity is excellent. OK small issue, this has several very faint orbs in the left side of the image that I can only see on a very dark to solid dark image. Trending at $159.77eBay determines this price through a machine learned model of the product's sale prices within the last 90 days. 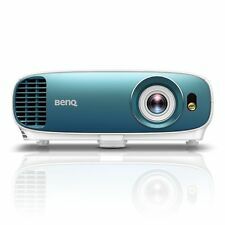 BenQ MX520 DLP Projector Refurbished Only 716 hr used. Display Type: DLP. Connection: HDMI, VGA, S-Video, RCA, USB. (no original box or other cables included). Internal parts, fans, connectors, lamp and filter have been professionally cleaned to improve projector performance and extend it's life. Everything included in the ad is shown in the pictures and listed in the accessories line unless otherwise stated. Everything included in this ad is shown in the pictures unless otherwise stated. We will help to resolve any issues quickly and fairly.